The Lord of the Rings: The Fellowship of the Ring – Did You See That One? After inheriting a mysterious and powerful ring from his uncle (Holm), Frodo Baggins (Wood) is forced to leave home on an epic trek to Mount Doom. He’s joined by an unlikely team that’s seeking to destroy the ring before it can fall into the hands of the dark lord Sauron. This is the opening installment of Peter Jackson’s epic series, pulled from The Lord of the Rings and The Hobbit by J.R.R. Tolkein. Jackson (The Hobbit: An Unexpected Journey) directed the series, and wrote the screenplay with Philippa Boyens (The Hobbit: The Desolation of Smaug) and Fran Walsh (The Hobbit: The Battle of the Five Armies). The film would earn a total of 13 Oscar nominations, including Best Picture, Best Director, and Best Adapted Screenplay. The massive cast features dozens of talented actors including Elijah Wood (Green Street Hooligans), Ian McKellen (X-Men: Days of Future Past), Orlando Bloom (New York, I Love You), Sean Astin (Rudy), and Cate Blanchett (Cinderella). The cast also includes Sean Bean (National Treasure), Christopher Lee (Hugo), Ian Holm (Ratatouille), Andy Serkis (The Prestige), Viggo Mortensen (The Indian Runner), Liv Tyler (Empire Records), John Rhys-Davies (Indiana Jones and the Last Crusade), and Hugo Weaving (Captain America: The First Avenger). It’s always a challenge to bring a known literary work to the big screen. The chances for failure exist from the very beginning. There’s also the challenge of doing justice to a novel that has a massive following. (In this case it’s a series of novels.) To complete the task, Peter Jackson, Philippa Boyens, and Fran Walsh worked alongside Tolkein scholars to make sure that they got things right. This didn’t mean taking the story as it was. There are several major changes made to assist with pacing and time. This doesn’t mean that the story doesn’t work. The writing does a good job setting the tone of the film early. (Which really set the tone for the following two films. (Five if you’re going to include The Hobbit series.)) Being the first of a series, the writing also introduces a huge number of characters to the audience. Thankfully the story allowed them to be introduced in ways that make sense with the overall plot. The writing also manages to boil down the events leading up to The Lord of Rings series really nicely. Like the story in general, the dialogue in the film brings out a mix of comedy, adventure, drama, and fantasy. There are some lighter moments that help to highlight the characters and their personalities. There are also some great dramatic moments that set things up for later in the film and the series. The action sequences are nicely built into the story as well. Overall, the writing really balances out the highs and lows of the story. The film also ends on a note that doesn’t leave too much unfulfilled, but still has enough questions to drive fans a little crazy. The acting in this movie is good across the board. All of the stars are uniquely transformed into characters that have such interesting qualities. 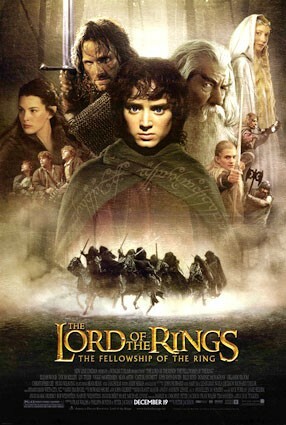 Elijah Wood leads the way with a great performance as the naive Frodo. This naivety evolves into wisdom throughout this film. Wood also finds great chemistry with all of his co-stars. Of his co-stars, Ian McKellen is my favorite. His performance as Gandalf gives this movie something special. It’s one of the more important relationships in the film, and these two bring it to life in all the right ways. McKellen was eventually nominated for Best Supporting Actor for his work on this one. The work done by Sean Bean, Orlando Bloom, John Rhys-Davies, and Viggo Mortensen is also great. These actors were part of the central cast that really drives this film. Bloom and Rhys-Davies have excellent chemistry and create some of the more comic and memorable moments in the movie. Mortensen was the right choice to play the conflicted and thoughtful Aragorn. The list of good performances continues with Ian Holm, Cate Blanchett, Christopher Lee, Andy Serkis, Liv Tyler, and Hugo Weaving. There are surely a dozen more actors I’m not mentioning who did their part in making this a really good movie. The tone of the film benefits tremendously from the understanding the actors seemed to have for the story. The acting was likely further complicated by the physical demands of the story as well as the makeup and costuming. Still, the cast does a really good job with this one. Even with good writing, this film needed great visuals. Jackson and his production crew were tasked with understanding and bringing the elaborate world of Middle Earth to life. This meant great sets, locations, costumes, and digital effects. Thankfully the film delivers on every count. As a fan of the Tolkein books I had high hopes for this one. The writing of Tolkien painted such a great picture of the world he was creating, and the crew translated this wonderfully. This movie earned Oscar nominations for Best Art Direction, Set Decoration, Best Costume Design, and Best Film Editing. The film won three of its Academy Awards for Best Cinematography, Best Makeup and Best Visual Effects. All of these nominations and wins were clearly deserved. The movie also earned nominations for Best Sound and Best Original Song. In addition, the score by Howard Shore (The Silence of the Lambs) is the perfect accent to the film. He earned his first Academy Award, for Best Original Score, for his work on this one. This film marked an excellent start to one of the more ambitious film projects attempted. The movie was a box office smash and ranks among the highest grossing films of all-time. The critics were generous with their praise of this movie. Richard Corliss of Time said, “His (Jackson) movie achieves what the best fairy tales do: the creation of an alternate world, plausible and persuasive, where the young — and not only the young — can lose themselves. And perhaps, in identifying with the little Hobbit that could, find their better selves.” I think this pretty much sums up the experience I had seeing this for the first time. This film does so many things right and has great repeat value. One of the best aspects of the film is the great ending. Without spoiling it, this movie leaves you wanting more to come. (Thankfully it did.) If you’re a fan of fantasy or adventure films, this is one you need to see. I also suggest checking out the extended version of the movie since it provides further insights into the characters that the theatrical release didn’t include. I give this one 4.7 out of 5 stars. Pingback: The Hobbit: The Desolation of Smaug | Did You See That One? Pingback: The Hobbit: The Battle of the Five Armies | Did You See That One? Pingback: The Hobbit: An Unexpected Journey | Did You See That One?